The work described herein was supported by the Mathematics eText Research Center (MeTRC).. MeTRC is a multi-site national research center based at the University of Oregon's Center for Advanced Technology in Education (CATE). The MeTRC project is the result of funding from the U.S. Department of Education, Office of Special Education Programs (CFDA No. 84.327H). Phase 1 (July 1 - December 31, 2010) involved refining the technology used for electronic reading of complex math, developing a protocol for conversion of traditional math materials to digital format (including use of MathML), and establishing a process for electronic delivery and routine classroom use of math content on a computer. Phase 2 (January 1 - June 30, 2011) served as a means for piloting school and student use of the digital math content in 6th grade to verify all issues were identified and resolved for full implementation in a real-world context. Phase 3 (July 1, 2011 - September 30, 2012) was a case study of math curriculum conversion and student usage of accessible math content in digital format during 7th grade. This study utilized a case-study approach to examine the different facets involved in attempting to digitize and deliver as many elements as possible of a 7th-grade math curriculum. This was intended to improve accessibility to learning for students with print-related disabilities, identified on their IEPs as needing reading accommodations. A unique combination of assistive technologies was employed that enabled students to electronically read aloud not just the plain math text (words), but also complex math symbols. Assessments indicated target students’ math performance improved beyond that of their peers, even though student interest in use of the technology diminished over time. It was found that students were more likely to use the technology to read when the instructional math content was more complex or the amount of the text being read was greater. The following is a case-study based on the primary research question: To what extent can a seventh-grade math curriculum be converted to an accessible digital format and integrated into instructional routine as an oral accommodation for use by students with disabilities? This investigation explored providing a small group of 7th grade students with disabilities improved access to their math curriculum by converting instructional materials into a digital format capable of being read aloud on a computer. For students who required an oral reading accommodation, this study went beyond the many prevailing efforts of supplying a core textbook in a digital version by also converting the majority of the math curriculum into a digital format. Unique to this endeavor was the use of relatively new technologies that allow computerized reading of not just the plain text (words) but also rendering the complex math symbols and equations for electronic text-to-speech by encoding with Mathematical Mark-up Language (MathML). In an effort to establish a basis for student need for support in reading of math content, a process was developed for assessing student ability to independently read a paper sample of typical math problems including both plain math text (words) and math symbols in a performance event. Analysis of results of the performance event administration at three regular intervals revealed the average student error rate for reading of math symbolic content was almost twice that of the error rate for reading of plain math text. This finding suggests the likely benefit of student use of math-aware text-to-speech technologies to help decode math symbols as well as plain text. The study also revealed that with practice, teachers learned to promptly identify what portions of each day’s lesson was able to be converted into digital format. This resulted in the printed materials being delivered to project staff in enough time (i.e. within 24 hours before student use) to be digitized and sent back to the classroom for students to use. Teacher comfort and confidence in integrating the use of these digital technologies into their instructional routine grew over time. Even though students quickly grasped the skills required to use the hardware and software, and interest and enthusiasm was initially high for access to and use of these reading supports, their usage waned as time progressed. This appeared due, in part, to their frustration in the time it took to start up their laptop and locate the proper file, as well as delays caused by occasional technical problems. However, researchers found students were more likely to choose to use the technology to read when the instructional math content was more complex or the amount of text being read was greater. Students did not appear to recognize their own errors when reading symbolic math content. Nonetheless, student performance improved over the course of the school year as measured by a school-wide math assessment administered at three regular intervals. Targeted students showed greater overall improvement than a comparison group of special education students, and that of the entire 7th grade class. We were not able to control for differences among groups, so it is possible these results were impacted by other factors. The following describes in detail the related research, methodology, results and implications of the findings of the case study. The Individuals with Disabilities Education Act (IDEA) of 2004 includes provisions for all children, including those with disabilities, to have access to the general curriculum. However, in spite of state and local efforts, access to the general curriculum does not appear to be happening at the level needed to improve performance of students with disabilities. Students with disabilities continue to be at higher risk for academic failure and overall under performance (Blackorby, Wagner, Cameto, Davis, Levin, Newman, Marder and Sumi, 2004), particularly in the area of mathematics (Allsopp, Lovin, Green, and Savage-Davis, 2003; Woodward and Montague, 2002). Although the performance gap between students with and without disabilities varies from year to year, the differences in math performance do not appear to be getting any better. The National Assessment of Educational Progress (NAEP) mathematics assessment scores for the 4th and 8th grades in 2007 showed that 67% of 8th grade students with disabilities were at the “below basic” or lowest level of math literacy, while only 26% of students without disabilities scored in this category (NAEP, 2007). In fact, it has been found that “between 6% to 7% of school-age children show persistent, grade to grade, difficulties in learning some aspects of arithmetic or related areas” (Geary, 1999 pg. 1). The advent of the National Instructional Materials Accessibility Standard (NIMAS) offered students with print disabilities significant, new-found opportunities for access to textbooks by the flexibility of using digital content. Under the provisions of IDEA 2004 and its implementing regulations, since December 2006, publishers have provided much of their textbook content in a NIMAS-compliant format to the National Instructional Material Accessibility Center (NIMAC) at the American Printing House for the Blind (APH) for distribution to states and local districts. As of April 2012, NIMAC included over 30,000 NIMAS textbook file sets received from publishers (NIMAC Update to OSEP, May 2012). A search of the NIMAC search engine (http://nimac.privatereserve.com/Search.aspx) found approximately 3,000 entries where "Mathematics" was the subject. That also appeared to be inclusive of subjects like Algebra and Calculus, but not of science texts which would also contain lots of math, like Physics. In other words, about 10% of the titles in the NIMAC are listed as math content. Unfortunately, the current NIMAS specifications do not require that publishers of math texts include use of MathML, which is essential for text-to-speech applications to properly read mathematics content. Using MathML enables mathematics to be served, received, and processed in digital environments such as the World Wide Web, just as HTML has enabled this functionality for literary text (Miner, 2005). Furthermore, using MathML provides for a standard approach to content tagging and information structure which can make mathematical information available to assistive technology in a way that is comparable to standard access by students without disabilities (Soiffer, 2005). “The purpose of this letter is to address the use of the most recent version of the Mathematical Markup Language (MathML) Structure Guidelines. The most recent version of the MathML guidelines is MathML3. These guidelines reflect the most effective method of providing accessible print instructional materials involving mathematical and scientific content to students who are blind or who have print disabilities, and do not conflict with the minimum requirements in the NIMAS. The National Instructional Materials Accessibility Standard Center funded by the U.S. Department of Education, recommends that the most recent version of MathML be used to improve the accessibility of mathematical and scientific content in core instructional materials. The Center has concluded that use of MathML3 will improve the format and presentation of mathematical and scientific content and assist SEAs and LEAs in providing accessible core instructional materials.” (US Dept. of Education, 2012) . This letter heralds a significant movement towards getting publishers to make not just plain math text accessible, but also the complex symbols and equations. Although the NIMAC repository has provided essential access to digital textbook content since its creation, it cannot ensure that publishers of math texts will comply with the OSEP recommendation of the use of MathML when submitting digital files. Thus, in the short term, special educators will have to continue to rely on other methods for acquiring math content inclusive of MathML. While the NIMAS provisions of IDEA are relatively recent, the practice of converting inaccessible print materials into accessible digital files has been in play for well over the past two decades (Lingane, Noble and Senge, 2002). Although earlier practice often relied upon using human readers to record materials onto analog tape, converting instructional materials into digital texts is now considered the first step to making them accessible to students with disabilities (Stahl, 2004). A growing body of research has demonstrated that access to and use of this material by students with print disabilities can contribute greatly to their progress by providing textbook content in an accessible form at the same time that the opportunity to learn exists for all other students, which is a prerequisite for participation in standards-based reform and accountability (Elmore, 1995; Guiton and Oakes, 1995). While research has shown the benefits of using digital curriculum materials in the classroom (Barker and Torgesen, 1995; Dalton et al, 2001; Erdner, 1998; MacArthur et al., 1995; Montali and Lewandowski, 1996), this research has primarily been based on increased digital access to plain text within textbooks, and has not focused on similar improvements with digital access to the total math curriculum, including use of MathML to enable more complex symbolic content to read aloud. This poses a challenge to realizing the full benefits of accessibility for students who struggle with math content at higher levels. For instance, it has been shown that a weakness found in many students’ mathematics ability is lack of focus on signs of operation as they read the language of mathematics. Students must be able to decode the meaning of symbols in order to effectively read mathematics (Adams, 2003). The first steps leading to the successful reading of mathematics involve the rapid and accurate recognition and pronunciation of words and symbols necessary to meeting a content objective. Without access to math symbols, students cannot be expected to know how to begin to solve the problem. “The key to successful reading of technical mathematics texts lies in the students’ abilities to decode the mathematical symbols and language used in such texts so they can extract the information contained in the text and understand the concept or solve the problem" (Borasi, Siegel, Fonzi, and Smith, 1998). While this access to math symbolic content can be provided by a human reader, technology allows the student to avoid waiting for external help by offering immediate access to content. In addition, technology offers a reading environment that provides students consistent, independent access to text and more opportunities to reread passages at their own pace (Flowers, Hong Kim, Lewis, and Davis, 2011). A cognitive task that can be provided by a computer is converting text, symbols, and mathematical notations (e.g., through text-to-speech). This technology can assist students who need help decoding text and symbols. Further, these tools take some of the load off the teacher (who cannot work individually with the whole class simultaneously). Unfortunately, there are presently only a small number of software programs developed specifically to assist students to overcome difficulties in decoding math and even fewer empirical research studies documenting the ones that are effective. This lack of software and supporting research can be seen as an opportunity for researchers and math educators (Hasselbring, Lott, and Zydney, 2006, pg. 6). While symbol processing ability is the basis for both language proficiency and achievement, it involves deriving meaning from symbols beyond the level of simple decoding (Fite, 2002). Research has shown the benefits of self-pacing in a computer read-aloud and has demonstrated that students with disabilities perform better on a math test when using the self-paced, computer read-aloud versus a video read-aloud (Hollenbeck, Rozek-Tedesco, Tindal, and Glasgow, 2000). Studies have also indicated that as the severity of the learning disability increases, speech synthesis systems enhance reading comprehension, as less time has to be devoted to struggling with decoding of words (Lewis, 2001; Raskind & Higgins, 1995). Central to student success, however, is teacher commitment to the integration of technology into the classroom routine. When this occurs, it has been shown that computers improve student proficiency in mathematics (Ozel, Yetkiner, and Capraro, 2008), though this requires that teachers must have access to technical support. If technical problems are not resolved in a timely manner, teachers tend to abandon efforts to implement technology (US Dept. of Education, n.d.). In previous work at the University of Kentucky (i.e., Supported Math Accessibility Reading Tool (SMART) Project), funded through a U.S. Department of Education Steppingstones grant, (CFDA 84.327A), researchers demonstrated successful use of current technologies (i.e., MathPlayer in tandem with Read & Write Gold) to render complex math textbook content accessible when using MathML. While many current assistive technologies can accurately read most elementary level math content, this is not always the case with math content of greater complexity. MathPlayer software, from Design Science, Inc., overcomes the limitations of current electronic readers in rendering much of the middle and high school math content accessible when coupled with select assistive technologies, such as Read & Write Gold (RWG) from Texthelp, Inc. (Soiffer, 2009). Findings from the SMART research included recognition of the limitations of only providing the math textbook in accessible digital format, as this left students without equal access to the many other components of the math curriculum derived from sources beyond the textbook (Lewis, Noble and Soiffer, 2010). As a result, there were days where students had no access to instruction when drawn from other commercial or locally created items. Plus, there were instances where the math material used or the classroom activity involved did not lend itself to digital conversion or usage on a computer. This raised the question of just how much of the complete math curriculum is conducive to digital conversion, delivery and use in accessible format (including use of MathML), and what variables affect these decisions or circumstances. These questions set the stage for the KY Math Etext Project examining digital conversion and delivery of not just the textbook, but as much of a complete 7th grade math curriculum as possible. This is based on the realization during Project SMART that while textbooks continue to play a significant role in the curriculum, textbooks are not the whole curriculum. Students will be able to have much greater access to what constitutes the full general curriculum, if mathematics textbooks as well as workbooks, handouts, and other materials (e.g., teacher-made worksheets, quizzes, etc. ), which represent the whole curriculum during instruction, are made accessible. This increased access is intended to improve chances that students with disabilities will comprehend these materials more readily and enhance their understanding of mathematics, resulting in better performance on assignments and tests. In order for this approach to be implemented, four issues need to be addressed. First, teachers need to be able to accurately and promptly identify beforehand what portion of each day’s instructional materials can be converted to an accessible digital format. Secondly, persons with expertise in digital conversion need to receive these materials with sufficient time to render them into an accessible format, including use of MathML when necessary, and deliver these electronic files to teachers for integration into routine instruction. Thirdly, students must be provided training in order to use the related technology at a sufficient level of independence. Lastly, essential to successful student use is having sufficient and reliable hardware and software, as well as readily-available technical support at the classroom, school and district levels. To what extent can a seventh-grade math curriculum be converted to an accessible digital format and integrated into instructional routine as an oral accommodation for use by students with disabilities? What factors determine whether or not seventh-grade math instructional content can be converted to an accessible digital format and delivered electronically? How can use of math etext be integrated by teachers into instructional routine as an oral accommodation in a math resource room setting? What skills do students need to efficiently use etext technology as an oral accommodation and what is an effective method of developing those skills? This research used an embedded multiple case study design (Yin, 2002) that also incorporated a participatory research-to-practice model. This included qualitative designs, empirical theory-driven reflective methodologies, and constituent group input (i.e., school administrators, teachers, students) on measures, interventions, and understanding of findings (Meyer et al., 1998). This approach was chosen to address each of the elements of the implementation process and classroom integration of math etext use as one unit of analysis. This was also because the target population (i.e., one resource room serving six students) represented a small, but heterogeneous population of students whose IEPs stipulated a need for an oral accommodation to access print materials. Data on classroom activities were collected by project staff approximately two days each week from September 2011 to May 2012 in a 7th grade special education resource classroom. A total of 49 sessions were spent in the classroom, generally on Tuesdays and Fridays, as these were the days when teacher instruction was typically more tailored towards use of materials having a greater need for read-aloud accommodations. Student Usage Log The Student Usage Log was used to determine the percentage of time spent using digitized vs. non-digitized content. It also tracked the amount and type of support provided to students by project staff, as well as number of students logged on each session, connectivity issues, and number of students needing support, including type of support. Content Delivery Tracking This tool was used by project staff to notify each other what and when content was to be digitized for delivery to the resource room, and document dates this actually occurred. It also tracked each instructional activity used in the classroom, including those that were and were not going to be digitized. This tool also provided record of production time for math content conversion, as well as document proofing to assure accurate representation of the original document. Teacher Interview Conducted three times per year to track teacher perception of issues, process and impact of student use of math etext. Student Interview Conducted three times per year to track student perception issues, process and any perceived benefits of their use of math etext. Student Technology Skills Checklist Identified the nature and sequence of tasks needed to be performed by students for successful use of math etext. Used for initial training and tracking of students in use of acquiring these skills. Math text & math symbol reading performance event A performance event administered on paper in October, January and May, assessing if students’ need for read aloud support to accurately read math symbolic content is comparable to need for reading of math text (words). MAP Math Assessment Measure of Academic Progress (MAP) test administered school-wide three times per year. Administrator Survey Conducted two times per year (Fall/Spring) to track school administrator perceptions and their reception to student usage of math etext. In investigation of these key elements, the research was conducted in the 2011-12 school year at a rural middle school of approximately 500 students. All Phase 3 project research activities were conducted in a 7th grade special education resource room. Student observations and digitization of math curricula began September 12, 2011 and continued up to May 15, 2012. The resource room setting included seven students, all of whom were identified on their IEPs as being in need of an oral accommodation to access print-based content. One of the seven students was dropped from the study during the second month of implementation, due to the extent of a language barrier that was too great to allow meaningful participation, even when supported by an interpreter. Five of the remaining six students had specific learning disabilities, while the sixth had a mild mental (intellectual) disability. From September 12 through November 15, 2011, the classroom was staffed by a substitute teacher, as the special education teacher of record was out on maternity leave and did not return until late November. Students eligible for participation in the KY Project were those with a documented need on their IEP for receiving an oral accommodation to be able to access print material. A major distinction of the technology used in the KY Project is its ability to provide an oral accommodation by electronically reading aloud not just the plain math text, but also by reading complex symbolic math content. In planning for the implementation phase, the question arose as to whether or not students with disabilities who have a documented need for an oral reading accommodation to access plain math text, also have a similar or different need for support in reading of math symbols. Thus, a process had to be devised to determine if, in fact, the students’ reading of complex math symbols was a documented need. Studies have pointed out limitations of past speech synthesis technology in reading aloud mathematical expressions (Russell & Plati, 2000). Research of reading accommodations on math tests has shown that students with reading disabilities benefited from having the questions read to them (Johnson, 2000; Calhoun, Fuchs and Hamlett, 2000), but has yet to examine the nature and extent of the need for the same support when reading symbolic math text. It was decided during Phase 2 of the project that a process needed to be developed to answer this question. This resulted in design of a math performance event. The math sample performance event was intended to determine the extent to which students were able to independently do what the project technology does, namely correctly read aloud the math content, including both the plain text and the symbolic text. This is directly related to the overall project purpose of providing as much of the math curriculum as possible in an accessible format as an oral accommodation, through providing students the unique tools of the project (i.e., RWG in tandem with MathPlayer to use with content coded in MathML) to read aloud both the plain text and the symbolic text. The Phase 2 pilot of the performance event entailed the development of an initial protocol to be administered to 17 sixth-grade students whose IEPs included an oral accommodation in math class. These 17 students were drawn from those served in the general education math class and a math resource room. The performance event involved having each student independently read aloud two grade-level paper math samples, one consisting of a sheet of primarily word problems and the second sample containing only math symbols. Project staff listened to each student’s reading and recorded his or her errors. Analysis of results revealed a stark contrast in students’ ability to read plain text vs. symbolic text. While the average student error rate in reading the sample of plain math text was 6.7%, the average error rate for reading a sample of math symbolic content was 36%. This difference was even more evident for two of the students who had an 8.2% error rate for reading math words and error rates in reading math symbols at 50% and 53%. This finding helped shape the process for replication of this performance event in Phase 3 of the project. In Phase 2, the reading of the plain math text and symbolic math text samples were administered separately. In Phase 3, this was changed by creating a combined single sample of typical math problems including both plain math text and symbolic math content. This change was needed to provide a mode of presentation which more closely resembled how a student would actually encounter such material in a classroom context. During Phase 3, the revised performance event was administered on paper to the six target students in October, January and May. Results showed students’ need for read aloud support to accurately read math symbolic content was consistently greater than their need for reading math text (words). Based on the analysis of the performance events given at the three intervals, the average error rate for reading math symbolic content was significantly higher than the error rate for reading math text (words)(see Table 2 below). The group’s average error rate across all three assessment administrations (October, January, and May) of the performance event for reading math symbolic content on paper was almost 28%, while the error rate for reading math text (words) was approximately 13%. In spite of this finding, observations revealed students tended to use their computers more for reading math text (words) than for reading math symbolic content. This may be due in part to their previous use of text reading software being limited to reading plain text and not the math symbols, so use of text-to-speech with math symbols was atypical. What factors determine whether or not 7th grade math instructional content can be converted to an accessible digital format and delivered electronically? The first study question focused on the technology and related processes that are necessary to convert and provide math content in a digital format. 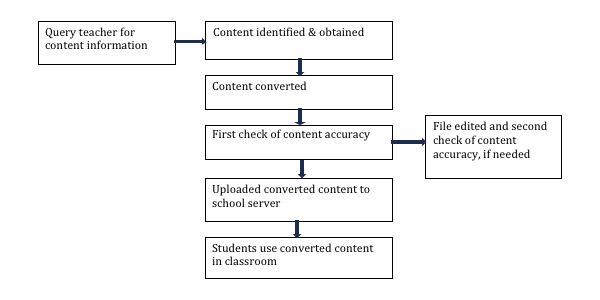 This process began with obtaining information from the teacher to identify the precise content planned for use in the classroom, converting the content by project staff into digital files, including MathML when required, proofing of the converted content by a second person (and editing as needed) for accuracy compared to the original source and appropriate read aloud by assistive technology (RWG), and uploading the finalized digital content to the school server for student usage. The following flow chart (Figure 1) illustrates the primary steps required to complete the content conversion and delivery process. In answering the first study question, a number of data points were collected. Data were collected on the types/formats of 7th grade materials and subtopics that were used by teachers to determine the percentage that could and could not be digitized. Data were also captured on the lead time provided by the different teachers, as well as time spent by project staff on digitizing materials, including variations found in the format of actual instructional materials selected by teachers for daily use. Technical issues encountered, such as problems with connectivity and laptop operation, were also tracked. An initial step involved examination of the extent to which the original formats of classroom materials were conducive to being digitized to include MathML. It was found that the formats of most instructional materials able to be digitized were commonly-used formats. This included publisher-created PDF files of the textbook and workbook, teacher-created MSWord documents, and pages of the teacher’s handwritten problems. Other than spontaneous board work, interactive web content, manipulatives, and highly graphical materials such as geometric figures, the vast majority of math subtopics could be digitized with MathML. Further study looked at the percentage of time the digital instructional materials were utilized in the classroom. Tracking of this issue during 46 of the classroom sessions revealed the digital instructional materials were utilized approximately 76% of the time. This included 44% of the time being spent on activities including digital materials with MathML (converted by project staff) and 32% of the time spent on digital content but without MathML (primarily content from an online math application). This left 23% of the time being spent on activities that were not digital. Items not subject to being digitized were those written on the board, use of math manipulatives or tasks that were too brief to warrant laptop start-up. In addition to the amount of instructional time digital materials were utilized, the number of instructional items/activities themselves was tracked and analyzed. Over the course of the project, over two-thirds of the math curriculum was provided in an accessible digital. From October to May, during the class periods researchers were observing, there were 115 different instructional activities with 68% (78) of those activities being digitized and 32% (37) not being digitized. Twenty-two of the digital items did not include any content requiring use of MathML (e.g., word problems). Some of these converted items were read correctly by the text-to-speech software and did not need conversion to MathML for accurate rendering. Others of these instructional activities were web-based content, most of which did not contain MathML. In particular, the school used an online math instruction application provided by the publisher of the primary math textbook, which contained MathML in some locations, but primarily used embedded recorded audio for access to symbolic text in the sections students most frequently utilized. During the first part of the Phase 2 Pilot, teachers were asked to identify and provide each day’s instructional materials two weeks prior to use. This is what was initially thought required to allow ample opportunity for project staff to convert materials to digital format with MathML, as well as a chance to proof the results prior to classroom delivery. It was quickly learned that the pace and fluidity of daily instruction were not predictable enough to allow teachers to accurately identify most material that far in advance. In fact, the goal became procuring materials to be digitized at least a day in advance (i.e., 24 hours in advance) to allow digital conversion in time for student use. Across the time span when the substitute teacher (9/12/11 to 11/15/11) was present, instructional content was provided at least one day in advance 81% of time. In comparison, the special education teacher (12/6/2011 to 5/15/2012) provided content at least one day in advance 68% of time. There were actually times math content to be digitized was not provided until the morning of the day of intended use, but project staff still managed to convert the content in time for student availability that afternoon. A possible reason that the substitute teacher was able to provide the next day’s material at least one day in advance more often than the special education teacher was that the substitute teacher routinely utilized the text workbook, while the special education teacher drew from a greater variety of sources, as well as created numerous materials by hand or on the computer. This resulted in more time needed for pre-planning and preparation day-to-day. In both cases, with experience, each teacher began to routinely identify content with more lead time as the year progressed. Digital conversion met the schedule for classroom delivery for 40 (98%) of the 41 math items converted. Although the percentage of content digitized for a class period varied greatly (from 0% to 100%), the average amount did increase from the time the data for the special education teacher was collected until the end of the year. 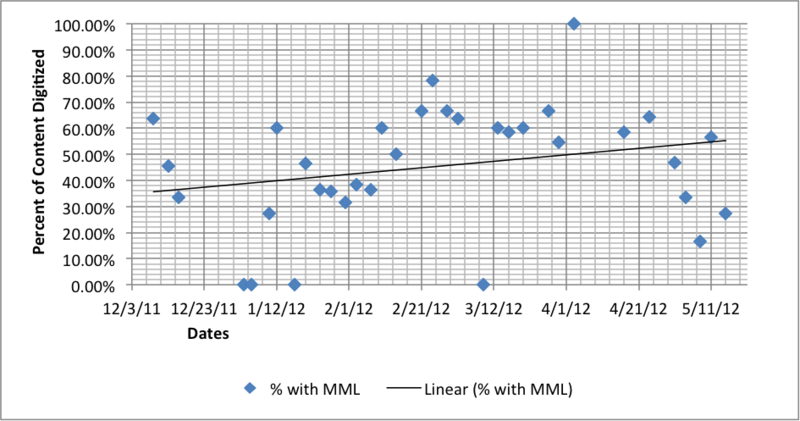 Figure 2 below shows the percent of time each class period was spent using content which was digitized with MathML (by project staff). The trend line shows that the amount of time increased from an average of 36% in December to an average of 55% by the end of the year. Provision of technical support was a critical element for successful student usage of the technology. Technical supports were documented across 43 of the sessions in which MeTRC staff were in the classroom or the lab setting (see Table 3). During this time, the six students logged in to their laptops 220 times in the classroom. Technical supports were provided 58% of the time (127 out of 220 logons). Of the 161 supports given during the 43 sessions, 59% (95) were needed due to student error and 41% (66) were needed due to technology related issues. Out of the 66 issues experienced related solely to technology issues (not due to student error), the hardware/laptop operation accounted for 68.2% of technology-related problems (see Table 4). Conversely , out of the 220 times students logged in to use digital math content, 21% of the time the problem experienced was solely related to the operation of the hardware/laptop, which means 79% of the time operation of the hardware/laptop was not an issue. Although connectivity issues were a consistent problem in the 6th grade math classes during the Phase 2 pilot, there were minimal problems with network access in the 7th grade resource room, with only 11 instances (16.7%) out of the 66 technical supports, or only 11 times (5%) of the 220 times students logged in. It should also be noted that only 4 technical supports were required (6.1%) during the 8 days spent in the lab setting where all the computers were hardwired workstations. How can use of math etext be integrated by teachers into instructional routine as an oral accommodation in a math resource room? The second study question provides details on how the substitute teacher and the special education teacher each responded to project activities in the classroom. This study also provides information pertaining to teacher perceptions of math etext use by the students, including the extent to which there were benefits or problems. It further describes the teacher’s role in providing technical supports needed by students. Although the substitute teacher cooperated with the project staff’s effort to integrate etext into the instructional routine and was very accommodating to the use of the laptops for instruction, she did not make a point to encourage the students to use the technology, but instead regularly concentrated on the students who were not using RWG and left the tech integration solely in the hands of the researchers. In contrast, the special education teacher structured her week for project staff presence around the two days when there was content which could be digitized. After the first few class periods, on days text-to-speech technology was used, she began encouraging students to use their text reader. Over time, she additionally reminded students to get out their technology and tried several strategies (e.g., tech use before worksheet, reward time using iPad for compliance, tokens toward class reward) to convey the value she placed on participation. Toward the end of the year, she was requesting content be converted for an assessment administered on a day project staff were not there to assist. The special education teacher reported during the interviews that she viewed student use of text–to-speech (TTS) technology as a reading accommodation that is less stigmatizing than support from a human reader, although it lacked the inflection and emphasis that a human reader can provide for better understanding. She felt students were more likely to read something repeatedly on the computer because no one would know they were doing it, so it could be done anonymously. She also reported that by providing students opportunity to have their math read aloud on computer, it allows students to have more independence. They can have it repeated over and over. Use of math etext allowed students to go at their own pace and helped the teacher avoid having to repeat reading aloud something missed by individual students. Based on the special education teacher’s self-rating over time, she felt more comfortable integrating use of math etext into her instructional routine. However, she continued to rely on project staff to provide students support in the steps and process of using the hardware and software. In December 2011, the teacher reported that on a five-point scale (1 = no knowledge, 5 = extensive knowledge) of how knowledgeable she was in integrating digitized material into classroom routine, she rated herself as a 2. In May of 2012, she rated herself as a 3. When asked how comfortable she was in integrating digitized accessible material into instruction, the teacher reported herself as a 1 (no confidence) in December, and in May as a 4 (fairly confident) on a five-point scale. When asked about the biggest challenge in integrating digitally accessible materials into the classroom routine, she consistently shared that material preparation and hardware reliability were the greatest challenges. She also expressed fear that if the students reached their frustration levels trying to get the computer to work, they were much less likely to stick with the math problems that were going to be challenging for them. Teacher willingness to independently use computers as an oral accommodation for students in math. Across time, the teacher reported improvement in ability to help students use their computer as an oral accommodation in math, but never rated herself above a mid-level on a five-point scale. When asked how comfortable she was in helping students use a computer as an oral accommodation in math, the teacher rated herself as a 1 in December, as a 3 in March, and again as a 3 in May. When the teacher was asked what the biggest challenge was for her in helping students use a computer as an oral accommodation in math, in December she said she didn’t know how to use the program. In March, she said computer (tech) issues in general were the biggest challenge, while in May she indicated it was getting the program up (initial setup). Teacher progression in skill level in providing technical support to students using computer as an oral accommodations in math. Although the teacher progressed in the self-rating of her skills in providing ongoing support to students using computers as an oral accommodation in math, she did not see herself getting beyond mid-level. When the teacher was asked how she would rate her skills in providing ongoing support to students using computers as an oral accommodation in math, in December she rated herself as a 1, in March as a 2, then in May as a 3. Teacher perceptions of ongoing implementation of use of math etext. The special education teacher reported that she viewed student use of TTS technology as a reading accommodation as less stigmatizing than support from a human reader. She noted additional benefit in terms of its anonymity because when students need help, the other students did not know it. While the special education teacher initially spoke positively of ongoing implementation of etext in her school’s classrooms, over time she voiced greater concern about how technical problems may hinder some students’ learning. When the teacher was asked what she thought about ongoing implementation of etext in her classrooms, in December she felt it was worth a try, to help the kids in a different way. In March, she felt the technical difficulties, for students already frustrated with math, further increased students' frustrations. She said that if it was in a computer lab, and everything worked liked it was supposed to, with the computers already logged on for them, then it would be more realistic to implement. She noted that the technical difficulties inhibit students from really showing their potential because their attention span is not initially very long. In May, the teacher felt ongoing etext implementation was a good thing for the students who wanted to use it on a consistent basis, but those who just wanted to get their work done were hindered by it. She felt there needs to be a way to entice students to use it so they will take time to do so. In order for students to be able to access and use math etext, they have to be taught how to use the technology (hardware and software). In order to provide and document student training, a Technology Skills Checklist (see Appendix A) was developed. Data were collected on the students’ training to use math etext, including rates of skill acquisition and maintenance. Specifics are provided on technical issues encountered by students, including differentiation between those resulting from student error vs. problems caused by the technology. This allows examination of student maintenance of skills throughout usage. A lot of information is drawn from student interviews across time, tracking their interest in and actual use of math etext. Before beginning student training and use of math etext, it was important to assess students’ prior technology experience regarding what skills they might already have and what impact these skills could have on their training or use. Interviews conducted with students in October 2011, regarding their existing level of technology experience, indicated they all generally had computer access at home. All had one to three other digital devices available. Four students said if they had RWG in their home they would use it, while one said maybe and one said he would not use it. Responses indicated overall a typical level of student access to, interest in, and usage of technology in non-school settings, so their pace of etext skill acquisition or maintenance was unlikely hindered by a lack of previous technology experiences. The next part of Case Study Question #3 dealt with the project approach to training students to use math etext. The process for this was derived from work during Phase 2 with the development of a Technology Skills Checklist that identified the nature and sequence of tasks students needed to perform successfully to use math etext. This Checklist was developed by conducting a task analysis based upon multiple direct classroom observations of 6th grade students using math etext during the Phase 2 pilot conducted in the second semester of the 2010-11 school year. Various adjustments were made to the Checklist during the pilot and again prior to initial implementation during Phase 3. The final checklist was implemented from mid-September into the first week of November 2011, with project staff observing individual students’ etext usage. It was postulated that a viable and efficient means of teaching students these skills was by direct instruction during their actual classroom use of math etext. The first trial for each student’s use of math etext was an “instructional” phase where they were individually directed and supported as needed by project staff through each of the thirteen steps identified as the Core Skills (shown below as listed on the Technology Skills Checklist). Turns on laptop or waits for active mode. Successfully types in login and password. Attaches 1 earbud (2 for independent work). Opens file of assigned content. Hovers over content to be read. Uses mouse to advance to next text/MML. Listens to math text via earbuds. Closes all windows before shutting down. It was theorized that most students could demonstrate at least an 85% success rate after one initial instructional trial and three subsequent follow up sessions. Analysis of data shows that after only one follow up session, three of the six students met or exceeded the goal of 85% success in the core skills required to independently use etext. One student accomplished this after two follow up sessions, the fifth student met criteria after three follow up sessions and the sixth student met the criteria by the fifth follow up session. These findings support the expectation that direct instruction during actual classroom use of math etext is a viable and efficient means of teaching students these skills. In view of the long sequence and complexity of the steps listed in the Core Skills, it is encouraging that many of the students met criterion as quickly as demonstrated, especially in light of the various characteristics they brought to the table, such as attention deficits, memory problems, cognitive issues, etc. Another data source used to gauge student skill maintenance was a series of questions included in the student interviews (see Table 5 & 6 below). These questions dealt with students’; perceptions of their abilities to accomplish the series of four of the major skills involved in use of the hardware/software and locating the correct math etext file for a particular lesson. These data track changes in student responses across time. The data show that most students initially (October) felt capable in three areas (i.e., laptop start up, opening RWG, reading with RWG), which may have been impacted by their just having been trained by project staff, as well as being in the early stages of use of the technology. It also indicates that by the end of May, all students felt they had mastered hardware startup; two students still conveyed problems opening RWG, two students had some trouble finding the correct math etext file, while only one student sometimes had difficulty using the computer to read math etext. 0 1 0 Only one student cited problems initially, but all reached proficiency by year’s end. 0 0 0 At least two students cited periodic problems throughout the year. 1 2 0 At least two students cited periodic problems throughout the year. 0 0 0 No students cited problems initially, but at least one student cited problems the rest of the year. Another one of the interview questions queried students over time as to their confidence in using TTS technology for reading math. During each of the three interviews, students were asked: “Do you think you know how to use the computer to read your math or would you need some help?” In May 2012, five students reported needing no help while one reported still needing some help. (Kind of help needed was log-in/start up and reading of math). This confirms that a few students needed help with Read & Write at the beginning, but did not need help with use of RWG after February 3rd. Do you think you know how to use the computer to read your math or would you need some help? 4 4 5 Responses indicate all but one student felt they could use math etext without needing help by end of school year. Since completion of the initial tech skills training, there were 95 instances of tech supports (see Table 7) that were caused by student errors. Locating the correct math etext file accounted for 56 (60%) of all student errors. The math etext file name was different each time a new digital math file was created, so it was expected that project staff would need to provide more assistance with this step. Given the expectation of students experiencing some difficulty in locating each new math etext file, the frequency of the remaining student errors listed above was fairly negligible. These data supports the hypothesis that the initial mode of training provided students was sufficient to equip them with skills necessary to use math etext. Student interviews also measured the extent to which students maintained interest in use of math etext. Student interest in using the technology waned over the school year, based on responses to student interviews in October, January and May. Of special note is that although 5 students preferred the computer as their oral accommodation in October, none of them still had this preference by end of the school year, with 3 students then preferring a human reader and 3 preferring just trying to read it by themselves (see Table 8 below). In May though, at least 2 students said the computer always helped in math class and 1 indicated it helped most of the time. 5 3 In Oct., five students preferred computer; none voiced this preference in May. 4 1 2 Trend was toward computer being less help. This finding concurs with classroom observational data taken since 10/4/11 regarding student active use of etext. These observations revealed that 36 out of the 69 times (52%) that math content was made available in digital format, no students chose to use the technology to read/listen; there were 33 times (48%) where one or more students did use the technology to some degree. A comparison of observational data with records of converted etext used over the year did show that students chose to use the technology to read/listen more often during the first two months of observation (October and November), than during any other period of the school year. This time period coincided with the tenure of the substitute teacher, who was using the standard text and workbook text content being used in the general education classroom. This publisher-created content was typically more complex in that it contained more math expressions and words per page on average than the content utilized by the special education teacher during the rest of the school year. This resistance in usage of the technology may have also been influenced by the brevity of some tasks; the special education teacher having presented material in smaller chunks to improve student attention and focus on the problems. Chunking of the tasks into smaller but more items may have also tended to make it less likely the students would go through the nine Core Skill steps necessary to get to each of the related math etext files. It was found, though, that students were more likely to choose to use the technology to read/listen when the instructional math content was more complex or the amount of the text being read was greater. Students more often declined use of technology when the assigned reading was very short, when the math content was simpler, and when the content had previously been covered in class. At three intervals during the school year, progress of all students in the school was assessed using the Measures of Academic Progress (MAP). Analyses of MAP math scores for October, January, and April were conducted for the six targeted students. Their scores were compared to the test results of six other students served by the same special education teacher in a different math resource room, as well as to the average results for the whole 7th grade (see Table 9 below). This analysis showed that the performance of targeted students in the intervention classroom increased more overall (Oct-Apr) than the performance of their peers in the comparison classroom and the entire 7th grade class. The increased improvement of the targeted students on the MAP math test compared to their grade-level peers provides tentative support to a possible contributing effect being their use of math etext. This research explored the many facets of math curriculum digital conversion and implementation for students with disabilities in need of a reading accommodation. It was based on the premise that while previous research and conversion efforts have been successful in conversion and delivery of the core textbook (i.e., Project SMART and NIMAS/NIMAC), there were still many other aspects of the total math curriculum in a print-based (inaccessible) format which required adult reading supports. The project, therefore, began working with school staff to identify all of the elements of the seventh-grade math curriculum amenable to digital conversion by project staff. This included embedding MathML into the digital content, which allowed students to use assistive technology to read aloud not just the plain math text, but also complex math symbols and equations. Once converted and checked for accuracy, the accessible digital version was electronically delivered to students for reading aloud on their laptops using assistive technology. In the planning phase of the project, the question arose as to what literature existed to support the hypothesis that by encoding content with MathML, students would benefit from this instructionally (i.e., the opportunity to read aloud complex math symbols and equations in addition to the plain math text). This led to the development of a performance event that was administered to the six participating students at three regular intervals during the school year. Results revealed that students’ average error rate for reading of math symbols was consistently twice their error rate for reading of plain math text. Although this finding needs to be replicated in additional studies, it has possible significant implications for the field. In our discussions with local teachers, reading of math symbols as an oral accommodation was not viewed as part of their established procedure, nor their understanding of what is needed by the students. While it is typical for an oral read aloud accommodation to include reading of math plain text, our analysis of state policies on read aloud accommodation on the math portion of state assessments reveals that in less than half of the states does it entail reading of the math symbols as well. Our findings show that nine states (18%) have policies which support the read-aloud of math symbols during state math testing and also provide specific directions on how math notation and symbols are to be read. Another ten states’ (20%) assessment policies include language which implies math symbols should be read aloud, but give little or no direction about how they should be read. Conversely, 26 states (52%) do not address the issue, while five states’ (10%) policies specifically prohibit read-aloud of math symbols during state level math assessments. However, the findings of this study suggest that student need for math symbols to be read aloud exceeds that of reading plain math text. This finding could have impact on classroom practices, as well as local and state policy regarding what constitutes read aloud supports in math at middle and high school levels. Also, since reading of the complex math symbols is one of the unique characteristics of this project’s technology, its use in the classroom setting further begs the question of how this electronic support aligns with existing practices in the provision of an oral accommodation in math instruction and assessment. Hopefully this finding will lead to more general and special education teachers becoming aware of this issue when planning reading supports needed by students during math instructional activities. Project results indicate that the majority of 7th grade math curriculum was able to be identified, digitized by project staff, and delivered in a timely manner, but technical issues affected its use by students. During Phase 3 of the project, 68% of the instructional activities were digitized, with only 32% not being digitized. Also, 98% of the instructional items conducive to being digitized were identified by teachers in time to be converted and delivered for student use. While the goal was for teachers to identify and provide materials at least a day (24 hours) in advance, there were times when materials were digitized with only three hours notice being given. This short turn around may attest more to the skill and expertise of the project technology specialist then to what could typically be converted locally with such short notice. In order to document each step followed in the conversion process, including how to embed math content with MathML, these elements were chronicled in a Technical Brief. This document is available from the MeTRC Project web site at the University of Oregon (http://metrc.uoregon.edu). Future research should examine the extent to which this information could be used by local school staff to convert and deliver accessible math content in an ongoing manner. This could foster the cultivation of more expertise being made available to math teachers and classrooms for digitizing of math curriculum, including the use of MathML. The frequency of technical issues was a critical element in student usage of the technology. Technical supports were provided/required during 73% of the 220 student log ins. Of those supports, 59% were needed due to student error and 41% were needed due to technology related issues. Out of the 66 issues experienced related solely to technology (not due to student error), problems with the hardware/laptop operation accounted for 68.2% of technology related problems (see Table 4). Conversely, out of the all the times students logged in to use digital math content, there were 21% where a problem was experienced solely related to the operation of the hardware/laptop. This leaves 79% of the time where operation of the hardware/laptop was not an issue. The prevalence of these hardware problems was enough to cause both students and teachers great frustration due to delays. In order for math etext to be well integrated into routine instruction, teachers need to be supportive of the use of technology to improve learning. The special education teacher reported during an initial interview of having extensive technology experience, although not with use of RWG. Based on the teacher’s self rating over time, she felt more comfortable integrating use of math etext into her instructional routine. However, she continued to rely on project staff to provide students technical support in the steps and process of use of the hardware and software. This may be illustrative of the dilemma faced by many teachers: when being faced with having to decide between devoting time to instruction or technology support, instruction tends to come first (Cuban, 1993). However, the special education teacher encouraged students to use their text reader and increasingly reminded students to get out their technology, trying several strategies to elicit compliance, which conveyed the value she placed on participation. When interviewed about the biggest challenge in integrating digitally accessible materials into the classroom routine, the special education teacher consistently stated that material preparation and hardware reliability were the greatest challenges. She also expressed fear when students became frustrated while starting their computers; they were much less likely to focus on working on challenging math problems. It was hypothesized that a feasible and effective means of teaching students the skills required to use math etext was by direct instruction during their actual math class. All students met or exceeded the project goal of 85% success in the 13 Core Skills required to independently use math etext by an initial instructional session, followed up with one to five follow-up sessions. In subsequent tracking of student errors requiring tech support, 95 (59%) of the 161 total supports needed were due to student errors during usage of math etext; locating the correct math etext file accounted for 56 (60%) of the 95 student errors. This support issue was to be expected; even though the etext file was always displayed in the same file location, the file name was different each time a new digital math file was created, so it was common for students to need help to find the proper file. This means that of the 95 total supports needed due to student errors, only 39 other student errors occurred, which accounted for only 24% of the total 161 tech supports required by students. These data support the hypothesis that the initial mode of training provided students was sufficient to equip them with using and maintaining the skills necessary to use math etext over time. Nonetheless, student interest and enthusiasm in using math etext diminished as the year progressed. It was found through student interviews that although 5 students preferred the computer as their oral accommodation in October, none still had this preference by the end of the school year, with 3 students then preferring a human reader and 3 choosing to try and read it by themselves. Furthermore, data revealed that out of all instances where math content was made available in digital format, 52% of the time no students chose to use the technology to read/listen, and 48% of the time one or more students did use the technology to some degree. Analysis of student usage did reveal that students were more likely to use the technology for reading support when the instructional math content was more complex and/or the amount of the text being read was greater. Students more often declined use of technology when the reading matter was very short, the math content was simpler, or when the content had previously been covered in class. A comparison of observational data with records of converted etext used over the year also showed that students chose to use the technology to read/listen more often during the first two months of observation (October and November), than during any other period of the school year. This decrease in use could be attributed to a variety of things, such as the change from content which was primarily based on the general education textbook and workbook to less complex content which was custom-created by the special education teacher. Observations indicated that of the 13 Core Skills needed for use of math etext, it took 9 steps just for hardware/software start up and locating the proper file. By the time students went through all 9 steps, the teacher had often already started instruction, so the students just resorted to referring to the paper copy instead. A related issue was that the technology being utilized was only able to read aloud the content and did not provide a way to input responses. Therefore, once the math problem was read by the computer, students had to resort to paper to record their answer. Having to read each problem with the computer, find the problem on paper to solve, then go back to the computer, etc., became tedious for some, if not all. It was also especially difficult for some students with learning disabilities to make the constant shift between formats and keep their focus on the task at hand. This suggests the need for faster, simpler, more reliable and flexible technology to be able to sustain the interest of the student, as well as to keep up with the pace of instruction. As said by David Rose of CAST, “Digitizing print materials is a start, but it is still anchored in the format and concepts of a print based world. Clearly, to be practical in the long run for everyone, the shift to providing digital curriculum materials and tools needs to occur from the top down.” (Rose and Meyer, 2002, pg. 168) Retrofitting print materials by digitizing is not a long term solution. By publishers including electronic learning supports and flexible user options from the onset, all students would benefit, not just those with disabilities. Analysis was conducted of the MAP math test scores administered three times during the school year. The average scores of the six targeted students were compared to the test results of peers, including six students served by the same special education teacher in a comparison math resource room, as well as the overall average results for the whole 7th grade. This analysis showed that on average, the targeted students’ math performance increased more over the course of the year than their grade-level peers. While it is not possible to clearly attribute the student use of math etext as being a factor in this improvement, it must at least be considered. Much more research is needed to confirm any real correlation. Regardless, these results do support the need for continuation and escalation of local, state and national efforts to expand the use of current and emerging technologies to create and deliver math curricula in accessible format for students requiring such supports to have more equal access to instruction and learning. Several limitations should be noted regarding findings from this study. First, with the student sample being limited to only six students it is difficult to judge whether or not the data sufficiently represent results which might have been obtained from a larger and more heterogeneous grouping. In addition, the six students who took part in this study were all served in a special education resource room; if the study was repeated to also include students with disabilities served in a general education setting, these findings may have been different. Another issue was the limited access to the classroom on the part of the researchers (only two days per week). It cannot be assumed that if data collection had been conducted on more and/or different days, the results would have been the same. An additional factor was that it had been expected that the 7th grade math curriculum content that was digitized would have included more items which required use of MathML. There were 28% of the activities digitized that did not contain math content of the complexity needed to be coded with MathML. If this study were to be repeated, it would be of interest to focus on high school content, such as 9th grade algebra, to determine how much of higher-level math content requires MathML to be fully accessible, as well as the potential for impacting both student performance and student perspective on the value of computer-based read aloud accommodations in the math classroom. Adams, T. L. (2003). Reading mathematics: More than words can say. The Reading Teacher, 56(8), 786-795. Allsopp, D., Lovin, L., Green, G., & Savage-Davis, E. (2003). Why students with special needs have difficulty learning mathematics and what teachers can do to help. Mathematics Teaching in the Middle School, 8(6), 308-314. Barker, T. A., & Torgesen, J. K., (1995). An evaluation of computer-assisted instruction in phonological awareness with below average readers. Journal of Educational Computing Research, 13(1), 89-103. Borasi, R., Siegel, M., Fonzi, J., & Smith, C. F. (1998). Using transactional reading strategies to support sense-making and discussion in mathematics classrooms: An exploratory study. Journal for Research in Mathematics Education, 29(3), 275-305. Dalton, B., Pisha, B., Eagleton, M., Coyne, P. & Deysher, S. (2001). Engaging the text: Reciprocal teaching and questioning strategies in a scaffolded learning environment. MA: CAST. Elmore, R. F. (1995). Structural reform in educational practice. Educational Researcher, 24, 23- 26. Erdner, R. A., Guy, R.F., & Bush, A. (1998). The impact of a year of computer assisted instruction on the development of first grade learning skills. Journal of Educational Computing Research, 18(4), 369-386. Fite, G. (2002). Reading and math: What is the connection? A short review of the literature. Kansas Science Teacher, 14. Kansas City, KS . Flowers, F., Hong Kim, D., Lewis, P., Davis, C. (2011). A comparison of computer-based testing and pencil-and-paper testing for students with a read-aloud accommodation. Journal of Special Education Technology, 26(1), 1-12. Fuchs, L. S., Fuchs, D., Eaton, S. B., Hamlett, C., Brinkley, E., & Crouch, B. (2000). Using objective data sources to enhance teacher judgments about test accommodations. Exceptional Children, 67(1), 67-81. Guiton, G. & Oakes, J. (1995). Opportunity to learn and conceptions of educational equality. Educational Evaluation and Policy Analysis, 17(3), 323-336. Hollenbeck, K., Rozek-Tedesco, M. A., Tindal, G., & Glasgow, A. (2000). An exploratory study of student-paced versus teacher-paced accommodations for large-scale math tests. Journal of Special Education Technology, 15(2), 27-36. Individuals with Disabilities Education Improvement Act of 2004 (IDEA), PL 108-446, 20 U.S.C. § 1400 et seq. Johnson, E. S., (2000). The effects of accommodations on performance assessments. Remedial & Special Education, 21, 261-268. Lewis, A. (2001). Reflections on interviewing children and young people as a method of inquiry in exploring their perspectives on inclusion. Journal of Research in Special Educational Needs, 1(3). MacArthur, C.A. & Haynes, J.B. (1995). Student assistant for learning from text (SALT): A hypermedia reading and aid. Journal of Learning Disabilities, 28(3), 50-59. Meyer, L. Park, H. S., Grenot-Scheyer, M., Schwartz, I., Harry, B. (1998). Participatory research approaches for the study of the social relationships of children and youth. In Ed. Meyer et al. Making Friends. Baltimore: Paul Brookes. Miner R. (2005). The importance of MathML to mathematics communication. Notices of the American Mathematical Society. Montali, J. & Lewandowski, L. (1996). Bimodal reading: Benefits of a talking computer for average and less skilled readers. Journal of Learning Disabilities, 29(3), 271-279. Raskind, M. H., & Higgins, E. L. (1995). The effects of speech synthesis on proofreading efficiency of postsecondary students with learning disabilities. Learning Disabilities Quarterly. 18, 141-158. Woodward, J. & Montague, M. (2002). Meeting the challenge of mathematics reform for students with LD. Journal of Special Education, 36(2), 89-101. Yin, R. (2002). Case study research: Design and methods. Thousand Oaks, CA: Sage Publications. Students trained in use of hardware procedures. Turns on wireless if needed. Relocates if low signal strength. Skills for student use of math etext. Sets RWG for web highlighting. F1: Opens content file needed. F2: Opens content file needed. F3: Opens content file needed. Uses auto-read next block of text. Lewis, P., Lee, L., Noble, S., Garrett, B. (2013). KY Math Etext Project- A Case Study: Math Curriculum Digital Conversion and Implementation. Information Technology and Disabilities E-Journal, 13(1).